If you have time to stop by the greenhouses behind Howlett Hall on the CFAES campus of The Ohio State University, you will likely see a compartment of raspberry plants under some pink/purple LED lights. The project is being conducted by the visiting scholar Ricardo Medina of Universidade de São Paulo in Brazil, and is a joint project of Dr. Gary Gao’s fruit production systems research and Dr. Chieri Kubota’s controlled environment research. Low temperatures and limited amounts of sunlight during autumn and winter time can be limiting factors for raspberry production in higher latitudes, especially inside greenhouses where the transmittance of light can be very low. Usually, plants in the field lose their leaves and go through dormancy; since many chilling hours are necessary for the buds to overcome dormancy, their harvest period is concentrated in summer, when the prices paid for the fruit are the lowest. 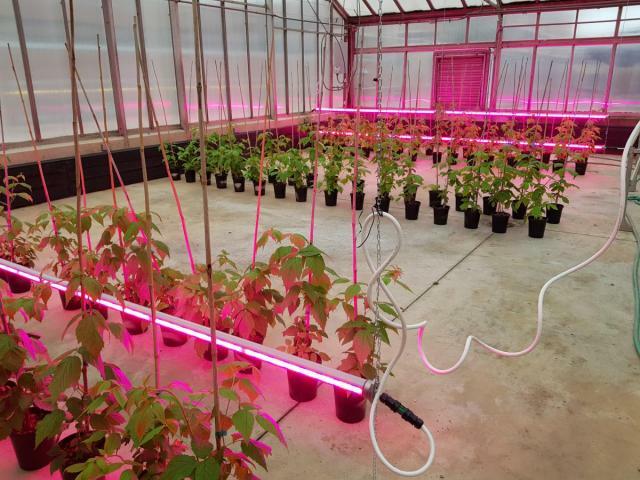 The experiment consists of growing raspberries in greenhouse conditions, using containers with substrates and intercanopy LED lights as supplemental lighting. With the warm temperature inside the greenhouse and the supplemental light provided by LED light bars, it is expected that the plants will not go through dormancy. The experiment has three different treatments considering the light intensity including: two layers of LED interlighting bars, a single layer of LED interlighting bar, and no artificial light. In addition, two cultivars with different fruiting habits are being tested. Plants will be tested for growth rate, harvest period, yield, and fruit quality in terms of marketable parameters, but also nutritional quality such as phenolic compounds content and antioxidant activities. Medina got a chance to sit in on Dr. Chieri Kubota’s Lecture on Controlled Environment. He also showcased his research project to the students of HCS 3200. The lecture presented by Dr. Chieri Kubota was addressed to the HCS 3200 – Horticultural Science class. Dr. Kubota was introduced to the students by Dr. Wendy Klooster at 10 a.m. and started her presentation focusing on controlled environment production systems, such as greenhouse (GH) and indoor production. She brought the key components required for each system and did some comparisons between those systems and the open field method for lettuce production, with data on spacing, yield, energy spent, total cost, and cost per unit produced – ending in a conclusion that indoor farming and greenhouse production can have an initial cost higher than open field, but due to a higher yield (units of lettuce head per area), the final cost per unit represents no more than 15% of increase compared to the open field system. This small increase in the cost may be overcome by a higher selling price when well-advertised that the product comes from controlled environment production, being a pesticide-free product (when that is the case). The manipulation of the environment was presented by Dr. Kubota in many aspects including hydroponics systems, management of light quantity and quality, and CO2 concentration. The light quality can be manipulated using LED lights, where you can deliver to plants the exact wavelengths combination you want, once LED lights are a monochromatic source of light. Combinations of red and blue lights have been studied for many leafy greens, and more recently, for tomatoes and other crops. Other advantages of LED lights include less heat emission and the higher light use efficiency, with a better conversion of energy consumption to energy use in photosynthesis. Also, the CO2 can be manipulated to enhance tomato production up to 20% and leafy greens up to 50% when increasing CO2 content from 400 ppm (current air concentration) to 800 – 1,000 ppm. Dr. Kubota gave some examples of successful greenhouse and indoor farming in Ohio, New ork City, Boston, and Tokyo. She also discussed future applications in controlled environment production with the use of drones and image recognition for real-time data collection in terms of the nutritional, pathological, and physiological status of the crop. She concluded her presentation willing a better interaction in between companies as well as academia, and suggests an open communication platform to share knowledge and technologies for indoor and greenhouse controlled environment production. Following the presentation, a tour with students was conducted by Dr. Kubota, Mark Kroggel, and Medina at the Howlett greenhouse facilities. The tour began with strawberry production in a soilless system, where Kroggel explained how they grow strawberries using trophy and substrate, with supplemental LED lights over the canopy of the plants. The students asked questions about cultivars, sunlight radiation, disposition, and spacing of the trophies. The tour continued to the greenhouse where a raspberry production system is being tested. There, Medina explained to the students his project, consisting of growing raspberries in containers using intercanopy LED lights to make plants avoid dormancy, and the effects of the system in the plant growth, harvest period, yield, and fruit quality in terms of marketable parameters and nutritional quality. Students asked questions about plant dormancy, light treatments applied, and comparison to the traditional raspberry production system. This project is part of Dr. Gary Gao’s small fruit projects in collaboration with Dr. Kubota. The last greenhouse visited was the teaching greenhouse, where undergrad students can learn how to grow leafy greens, vining crops, and have the opportunity to understand different hydroponics systems. Acknowledgements: We would like to than Dr. Abhay Thosar, a senior Plant Specialist of Horticulture LED for Signify (signify.com/en-us) in United States and Canada for the generous donation of LED lights used in the study. Their global brands are Philips (lighting.philips.com/main/products/horticulture/language-selector) and Interact (interact-lighting.com/global) Stay tuned for more exciting results from this project! Please visit southcenters.osu.edu/horticulture/fruits for more information on Dr. Gary Gao’s research projects and extensive activities.